Yes. Missouri is a pure comparative fault state. What that means is you can recover compensation, no matter how much you’re at fault. If you’re 99 percent at fault it is going to be really difficult to win a case. But if you’re 99 percent at fault and 1 percent another person’s fault, you can recover for that 1 percent. The way this is accomplished in a jury trial is a three-step process. The jury first determines an allocation of fault. If the jury believes the evidence shows you share some responsibility in your injury causing event then you will receive an allocation of fault. For example, 50 percent your fault, 50 percent the defendant’s fault. The jury will next determine your total damages, and set aside any allocation of fault that had been assessed to you to reach a total damages value for all your harms and losses.. What’s the total damage? What injuries are there? Costs, including medical bills, time off?? What is no longer a part of life because of these injuries, such as a good night’s sleep, hobbies, walking, sitting or standing pain-free? A value to compensate for these total damages is determined by the jury ignoring any allocation of fault, for example, $100,000. No matter what if you do share fault and an injury happens, you, of course, do have a claim. It’s worth pursuing. Sometimes people are a little bit rougher on themselves than they need to be with what they think is their fault. It may well not be their fault, what if the electric signal was defective and displayed two different signals? It all depends on the circumstances of your auto accident. A lot of times, you may think it’s your fault. It may very well be something outside of your control. 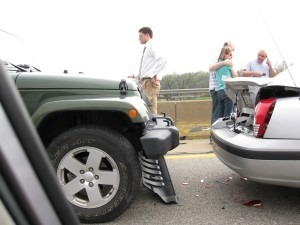 That’s why it is important to discuss your accident with a personal injury attorney. What may seem like partially your fault could have not been in your control at all. If you have questions about your car accident in St. Louis, Missouri that you think may be partially your fault and you are injured, be sure to contact your local car accident personal injury lawyer.